49 Dead In 'Terrorist Attack' At 2 Mosques In Christchurch, New Zealand New Zealand Prime Minister Jacinda Ardern says the shooting can "only be described as a terrorist attack." Authorities have charged a male in his late 20s with murder. Ambulance staff take a man from outside a mosque in central Christchurch, New Zealand on Friday. Multiple people are in custody after shootings at two mosques there. Two mosques in Christchurch were attacked Friday around the time of afternoon prayers. A male in his late 20s has been charged with murder, New Zealand Police Commissioner Mike Bush said. Three other people were apprehended, though one of those people might not have been involved in the shootings. Bush said it would be "improper" to confirm the identity of the person charged at this point. Bush said police have recovered "a number of firearms" from both crime scenes. There were also "possibly" two improvised explosive devices on one vehicle, Bush said. Police have disabled one and are in the process of disabling the other, he said. 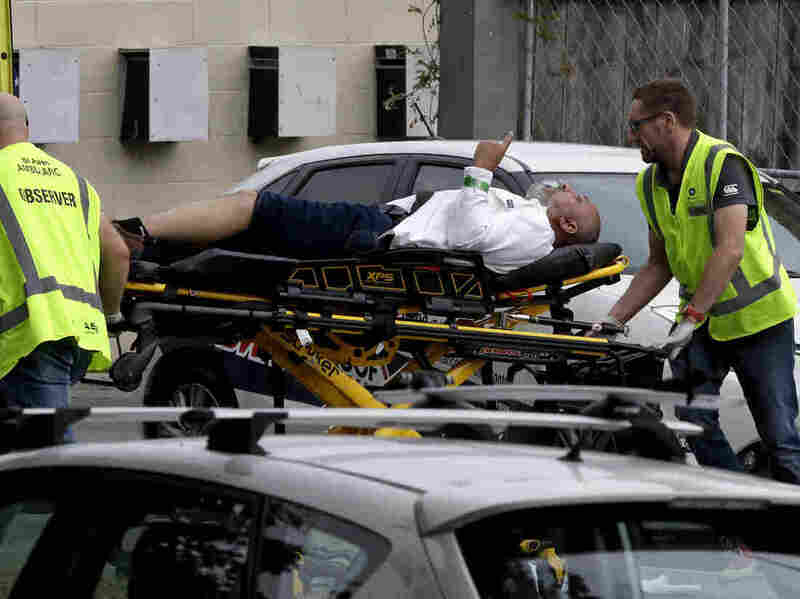 Bush said 41 people were killed at the Al Noor Mosque near Hagley Park in the city's center; seven were killed at a mosque in Linwood, a few miles away. One person taken to a hospital died from injuries sustained during the attack. Ardern said the attack by people with "extremist views" was "unprecedented — unlike any that we have experienced before." None of those in custody were on any active security watch lists, either in New Zealand or Australia, Bush said. New Zealanders must continue to feel secure in their country, Ardern said. "We represent diversity, kindness, compassion, a home for those who share our values, refuge for those who need it. And those values, I can assure you, will not and cannot be shaken by this attack." One of the individuals in custody is Australian, according to Australian Prime Minister Scott Morrison. Christchurch Hospital said it was treating 48 patients for gunshot wounds, CNN reported. Bush said earlier that police haven't been able to identify the victims yet because the mosques are still on lockdown. New Zealand Police say they have asked all mosques across the country to "shut their doors." Bush urged anyone who had intended to visit a mosque in New Zealand not to go, to "close your doors until you hear from us again." The public was being urged to stay indoors. Bush said he was aware of reports that the shooter had live-streamed an attack online. "We are doing everything we can to remove it," he said. This is a developing story. Some facts reported by the media may later turn out to be wrong. We will focus on reports from police officials and other authorities, credible news outlets and reporters who are at the scene. We will update as the situation develops.